Rose Paper Press offers printed and printable designs. If you order printing services, we will print your order and ship it directly to your door. You can also choose to purchase digital/printable files and print your designs yourself. Yes! I offer high-quality professional printing on thick card stock. Shipping is FREE on all printed orders. Can I print my designs at home? Yes. If you’ve purchased printable designs and are printing at home, I recommend using thick white card stock. Every printer is calibrated differently, so I suggest printing a proof prior to printing all of your paper goods. Rose Paper Press is not liable for print quality issues if you choose to print yourself. Can I use a printer of my choice? Yes. If you are printing digital/printable designs yourself, I recommend using a high-quality printer. You will need to select the “Upload Your Own Design” option to upload your files for printing. Each printing company has different paper sizes and bleed requirements. Your files will have standard sizes and bleed lines to help ease this process for you. However, please check a proof prior to printing your entire order to assure all information is within the bleed lines. Rose Paper Press is not liable for print quality issues if you print yourself. 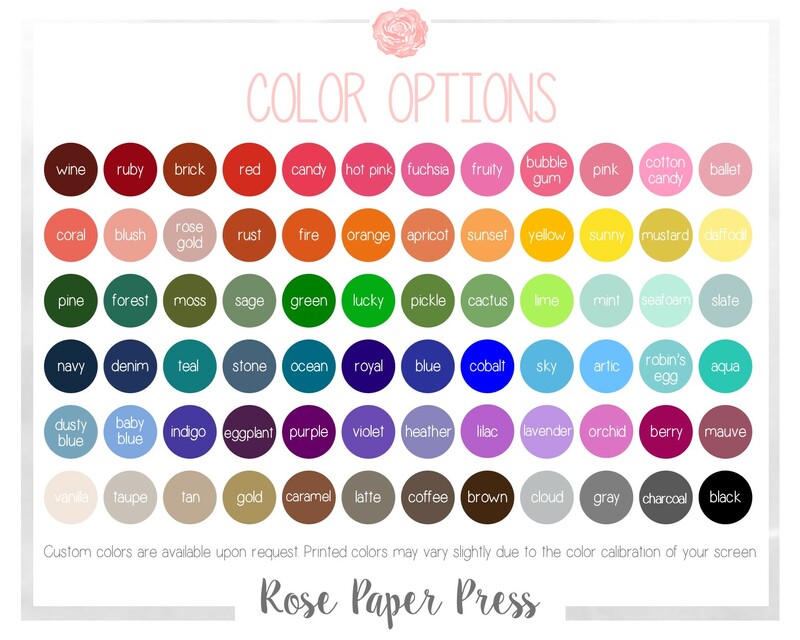 Did you know that Rose Paper Press also offers printing services? If you’re considering printing with another print shop, check out my printing services. I offer competitive pricing, quick turnaround, and free shipping. If you use my printing services, I know your order will print perfectly so you have the highest quality paper goods. I offer a wide variety of paper types, sizes, and shapes. If you’re ordering printed items, it will be printed on 110 lb ultra white card stock. Additional paper types are available upon request, including metallic pearl, eggshell, felt, recycled, and linen. Options from 80 lb to 240 lb card stock as well as various die-cut shapes are also available. Contact me prior to purchasing to discuss additional costs for different paper types or die-cut shapes. Yes! I offer return address and/or receipent address printing. Will the colors on my printed designs match the proofs on my phone/computer screen? I can’t guarantee printed colors match your screen exactly, but it should be close. Due to the color calibration on your screen/monitor, colors may vary between online viewing and the printed item. If you’re matching an exact color, you can purchase a printed proof to assure the colors are perfect for your event. Yes! I love bringing your ideas to life – whether that’s a sketch on paper or just a thought you have in mind. If you’re interested in a custom design, contact me for more information on the process. Can I change the colors on a design? Yes! I can color match almost any color. There is a color chart to choose from, or you can send me a color of your choice to match. If you would like changes to a design’s colors, please mention it in the notes box at checkout. Please note, colors may vary between online viewing and the printed item due to the color calibration on your screen/monitor. I love one of your designs, but I want to change some of it. Do you accept design changes? All designs are personalized with your event information for no additional cost. Minor changes to wording, font, and colors are usually at no additional cost. Any significant changes to the design may require a design change fee. Please contact me prior to purchasing to discuss any design changes and I’ll let you know if any additional fees are required at the time of purchase. I love one of your invitations but want it for a different occasion than what's pictured. Can I change the occasion type? Yes! I can customize any of my current designs for your event by turning a birthday invitation into a bridal shower invitation, etc. for no additonal charge (as long as there are no revisions to the design layout and elements). Yes, as long as you contact me prior to purchase for a custom listing. If you purchase an instant download, no proofs or revisions are included. The file delivered is exactly as shown in the listing. Once you purchase an instant download, it cannot be customized or edited. Do you design other matching items in a theme? Yes! Some themes have matching items already designed and available for purchase. If you don’t see what you’re looking for, you can also use this matching item listing and purchase add-on matching items for your theme. If you have any questions or are looking for a custom matching item, please contact me. I have a specific design idea in mind. Can you replicate it? If we are working on a custom order together, I appreciate inspirational pictures or ideas to help me get a sense of your style. I respect the intellectual property of other designers, so I will not copy or recreate another designers work. I will work with you to design something inspired by your ideas in my own style. Proofs will be sent for approval within 1-2 business days. Once approved, printed items will ship within 2-3 business days. Once shipped, most orders to the continental U.S. arrive within 1-4 business days. Please be aware that we do everything we can to assure your order arrives in a timely fashion. However, once an order ships it is out of our control and there may be rare unforeseen circumstances (natural disaster, weather) that delay the shipment. When will I receive my printable items? Your personalized files will be emailed to you within 1-2 business days. When will I receive my instant download? Files are available to download immediately after purchase. Timing estimates for custom orders will be discussed and agreed upon prior to purchase. Do you offer rush shipping for printed or printable orders? Yes, rush shipping is available for all printed and printable items. Rush orders are available upon request for a nominal fee and can be arranged by contacting me. What is a printable or digital file? If you order a printable/digital design, you will not receive any printed/physical items. You will receive a JPEG or PDF file that you can use digitally or have printed. Instant downloads are digital printable files available immediately after your payment is confirmed. No proofs or revisions are included. The file is delivered as shown in the listing. If you would like an instant download customized, please contact me so I can create a custom listing for you prior to purchase. Once you purchase an instant download, it cannot be customized or edited. Will I be able to review my design before it is finalized? Absolutely! I email you a proof on all orders except instant downloads. How many revisions can I make to my design proof? Two rounds of minor revisions are included at no additional cost. Revisions include text and color changes, not changes to the design itself (design elements, layout, etc.). If you need additional revisions, they cost $5 each. I made a typo in the information I gave you to personalize my design. Is it too late? No worries – we’re all human! Please proofread your information prior to submitting your order. If you made an error, please let me know as soon as possible so I can update your order. If you catch the error during the proofing process, there is no charge to make the changes as long as you haven’t exceeded the two rounds of included revisions. The date/location changed for my event. Can you update my design? Original files are kept for 30 days. If you are within this 30 day window, contact me and I can make the change for you. If you haven’t used the two rounds of revisions included with your order, there will be no charge to update the date/location. If an order needs to be revised after the 30 day window, the design will need to be repurchased. If you’re ordering printed items, I cannot make any changes once you approve the order to print. We already finalized my design, but I have a more revisions. Is it too late? Once your design is finalized, there will be a charge of $5 for each future revision. Please keep in mind that original files are only kept for 30 days. If it has been longer than 30 days since we finalized your design, the design will need to be repurchased. Can I edit your designs myself? No. All designs are personalized and customized by Rose Paper Press. I do not offer templates that you can edit. All designs are property of Rose Paper Press. Edits or customizations are prohibited. Please see the legal section below for more information. Due to the nature of printed and printable designs, refunds are not available. I pride myself in outstanding customer service and want you to be satisfied with your personalized designs. If you have any questions or concerns about your order, please contact me. Can I cancel an instant download order? Since the file is delivered to you immediately upon purchasing, all instant download sales are final. Can I get a refund for my printed order? We do not offer refunds on printed products. Please assure you review the final proof before approval, as we do not offer any refunds or reprints of any errors approved in the final proof. Rose Paper Press is open for orders 7 days a week, but only open for correspondence and order fulfillment Monday – Friday. You can fill out the form on the contact page or email me. Rose Paper Press is an online business working with clients worldwide. I ship printed orders anywhere in the U.S. and send digital items anywhere in the world. I live in Glen Carbon, Illinois (about 25 minutes from St. Louis, Missouri). I purchased a design from you, do I own it now? Rose Paper Press owns all copyrights, digital files, listing images and descriptions. Artwork ownership is not transferred by purchasing an item. Can I share/edit/resell your design? No – it violates my intellectual property. There is absolutely no reselling, sharing, copying, redistributing, or recreating my designs. All work by Rose Paper Press is protected by copyright laws. Can I use my order for commercial use? Purchases from Rose Paper Press are for personal use only. If you would like to use a design for commercial use, please contact me for more information on the commercial process and licensing fee.